You’re a heart-centered woman servicepreneur with a message, gift, skill, knowledge or expertise – your brilliance – to share. AND you want to position, package and price your expertise in a way that attracts BETTER, fun & exciting clients who get and value you – while being totally YOU. You know you’ve got a valuable message, a gift, a skill, a ‘knowing’, a talent, an expertise that you DEEPLY DESIRE to share with as many people as possible. You’d LOVE to spend each day of your life supporting people in creating transformation in their lives and getting truly amazing results. You’re ready and happy to share ‘your brilliance’ (that special mix of ‘you’ that comes from your experience, lessons, certifications, loves and victories) with people that truly value what you have to offer. And you KNOW there are people ‘out there’ that are looking for the message, expertise, and gift you’ve got to share. You want to stop feeling like you must quash your amazingness and “be professional” or present yourself in a particular “recommended” way that feels inauthentic to you. What you want right now is to embrace YOU with all your goodness and use it to create a successful business you’ll love and enjoy wholeheartedly, sharing your expertise. A business that attracts fun and exciting clients who get and value the real you – exactly as you are. Your business doesn’t have to be drab, boring, and devoid of a soul. And I can help you truly enjoy serving your clients doing meaningful work you love. If you're ready to say a big YES! to yourself and create and grow a fun and profitable business, you're in the right place. Hi! 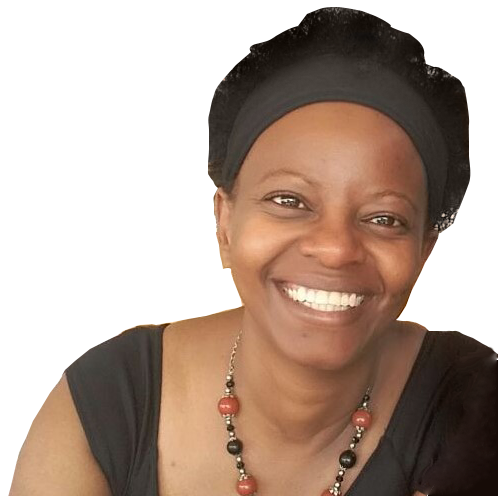 I’m Carol Nyambura, the Chief Empowering Officer (CEO) of Package and Thrive. I empower and inspire ambitious, heart-centered female servicepreneurs like you to build a business that’s true to who they are. I suffer from a heady and healthy dose of woo-curiosity, restlessness, and practicality😉🤣. I love making it easy and enjoyable to learn and implement. I truly believe you can get great results with ease. I’ll show you how to joyfully share your expertise and create a great income and impact while remaining true to yourself. I can help you take what you know – “that thing you’re good at” – and create programs and services that will have the right people truly excited to learn from you. And that will allow you to contribute to transforming people’s lives in ways that matter to them and that will leave you more fulfilled. I'm here to help you express and package what you do in a way that fully represents who you are and resonates with and attracts the right people for you. We’ll seek clarity on who’ll benefit most from working with you, how you help them, how to best package your offers, and the value of your services. We’ll leverage your brilliance (that special mix of ‘you’ that comes from your experiences, talents, passions, victories and any courses or certifications) to create something that not only resonates with great clients, but also fully represents you. How you express your brilliance matters. It makes the difference between serving many great clients and serving a few great clients now and then. I'd love to support you in creating a successful business sharing your expertise, doing meaningful work that you love, and serving fun and exciting clients, while still remaining true to yourself. You take responsibility for creating the kind of results you want to see in your life and business - in other words, you don't waste your time feeling sorry for yourself or blaming other people or external circumstances for where you are. You don't make up excuses for why things are the way they are in your life. You recognize your current circumstances for what they are - a challenge that needs to be overcome. And you're so, so ready to take it on! You're willing to invest in yourself to achieve the goals you want. There's really nothing that comes free, and you know that. So you're willing and ready to invest whatever it takes to achieve the results you desire - your time, your brain power, your emotions, your muscle, and your cash when necessary. Even though I like to laugh and have fun along the way, I’m no pushover… Ever heard of the term “tough love“? That tends to describe me quite well 😉 I’ll push you. I’ll stretch you. I’ll hold you as powerful, no matter what, even if you may not be able to do so for yourself. I’ll want to see you grow beyond your (wildest) dreams. And I’ll help you celebrate every step of the way. So if you can’t deal with being pushed and stretched, then I’m not your gal. I really want the GREATEST for you, and I’ll do what I can to help you get that. You owe it to yourself and to the people you're meant to serve to GET out there and share your gifts with as many people as possible. I can't wait to help you reach and serve many more amazing clients in your business while remaining true to yourself! Here's to expressing and sharing your brilliance!